Our vision is essential to allow us to live active independent lives. Any drastic changes in our sight or the loss of our vision altogether can have a great emotional impact. The Chicago auto accident attorneys of Rosenfeld Injury Lawyers LLC do whatever it takes to help victims recover from their physical injuries and return to happy and healthy lives after an accident, but the loss of sight can render a person unable to ever enjoy his or her life like they once experienced. In order to help victims adjust and cope, our reputable personal injury attorneys always seek the maximum amount of financial compensation available on behalf of our clients so that their needs are met and they can overcome their disadvantages. Car, truck and motorcycle accidents can quickly displace energy forces caused by the crash. The devastation can have a long-lasting impact on every injured victim. Blows to the head or face can cause physical trauma to the eyes or the brain that can impact the eyesight and cause a short-term or long-term injury. 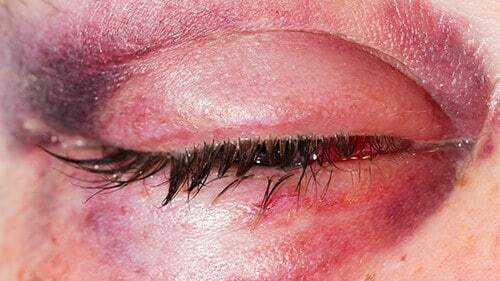 Many of the physical injuries sustained to the eyes can be repaired so long as the eyeball and supporting muscles did not suffer extensive damage. Other measures can be taken to account for diminished vision like using prescription eyewear or surgical procedure repairs. Neurological disorders associated with car accidents can have a much more permanent impact on eyesight. Our Chicago auto injury lawyers have helped clients with the following conditions recover the financial compensation they are entitled to receive because of their damages after their accident. The loss of tracking ability, which allows the eyes to follow objects or to read the words on a screen or piece of paper. When the eyes are unable to track, the victim may be able to see what is in immediate view, but unable to focus on an object or read documents. The loss of fixation. Tracking is the ability to move from one object to another or to follow moving objects in view. Fixation allows the eyes to focus on a single item within the visual field. Fixation is important to direct attention in order to assess a threat or to perform a task linked to eye-hand coordination. Loss of depth perception. Many left turn accidents are linked to diminished depth perception in older drivers. This skill is the ability to tell how far away an object is and accurately determine its approaching speed. The loss of such a skill makes it impossible for a victim behind the wheel to drive the vehicle safely, which could threaten their independence as a result. The ability to change focus. We don’t realize or think about it, but whenever we focus on one area within our field of vision, the rest of the field becomes blurred, much like the lens of a camera focuses on the object in the foreground of a picture. Brain injuries can make it difficult for our eyes to focus where we want them to, and make objects blurry or contorted. The loss of peripheral vision. Our ability to detect objects at the edge of our visual field alerts us to potential dangers and threats. Certain injuries and disorders can diminish this ability and limit our visual acuity. The inability to store or recover imagery. Traumatic brain injuries can make it difficult for victims to picture images or remember what objects or people look like. This adds insult to injury in some cases, as it distorts victims’ memories while impacting their ability to see in present time. Sensitivity to light or glare. Some injuries or disorders can force victims to avoid sources of light due to sensitivity and pain. Loss of vision. Blindness changes the victim’s life forever. Many victims are forced to rely on others while they adjust to a life without sight. Our Chicago auto injury lawyers understand the financial and emotional impact that the loss of vision has on the victims of car, truck and motorcycle accidents. In many cases, the loss of their vision impairs their ability to maintain employment and costs them their independence. These factors must be considered when determining the value of a financial recompense claim. Our legal team will aggressively pursue all of the monetary compensation you are entitled to receive by using every legal avenue available. There are limits to the extent of damages you can recover from a negligent driver’s insurance, but your own insurance may be able to cover the difference. Rosenfeld Injury Lawyers LLC has helped thousands of car, truck and motorcycle accident victims recover compensation to pay their medical bills, the value of lost wages and provide money for the emotional and physical pain and suffering they have endured. Our knowledge and experience will ensure that you have the best chance of successfully resolving your case. Our reputable personal injury lawyers will leave no stone unturned when seeking avenues to recover damages on your behalf. Contact us today to arrange a free consultation with one of our award-winning Chicago auto accident attorneys so that we can review your legal options and let you know everything to expect during the legal process. Since we work on a contingency basis, you never need to worry about how or whether you can pay for our services. We only receive payment for our legal work after we secure damages on your behalf. If we are unable to recover the monetary compensation you are entitled to receive, our services will be free of charge.